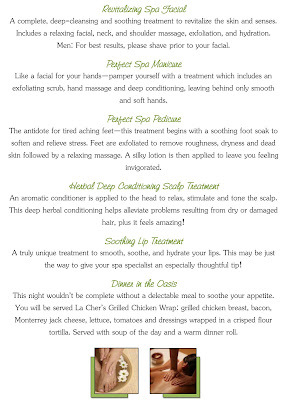 I’m sure everyone has heard about a romantic spa night at home, but I’ve taken all the detail work out of it for you…You just worry about getting those hands in good shape so they can handle a night of pampering the one you love! 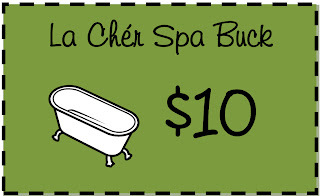 I will customize my Spa Brochure and Spa Bucks to include the name of "your" spa (rather than "La Cher"). 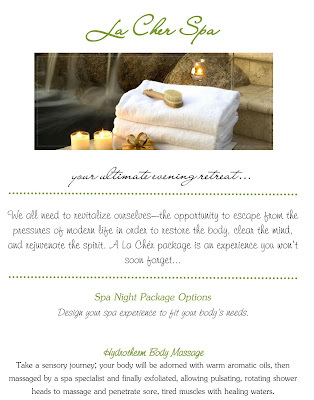 You'll receive the *digital* PDFs of the Brochure and Spa Bucks for easy printing! I planned ahead so my husband would have something to look forward to. I planned the Spa Night for Friday, but on Monday, I started giving him these “spa bucks”—which hinted at what he could expect, but still left him in suspense. After he took out the trash, or fixed something in the house, killed a spider, or did the dishes---pretty much ANYTHING good, I would give him either a $5 or $10 spa buck coupon. So, he collected and he caught on quick! He figured the more bucks, the better… so he was scrubbing the house, SEARCHING for spiders, making me laugh, and finding anything possible that could be taken to the trash! You must check out my original post HERE with all the details to pull off this wonderfully romantic evening. Email loveactuallyblog @ hotmail.com with a request for the customized Spa Package. Note: No items will be shipped. This purchase is for digital items only which you must print or have printed.